I’m Amy, the daughter/granddaughter of the owners. My Mom (Debbie Knobelsdorf) moved to Huntsville with my grandparents (Rose and Armand Blanchette), in 1979. Our family had been cottagers in Huntsville since 1971, and fell in love with the area. When the opportunity arose for them to purchase Westside Variety at 126 Main Street, they jumped on to it, as it had been a dream to move to Huntsville year round. It soon became apparent that there was a demand for a restaurant in the area and a small take-out menu was started. In 1983 a full kitchen was installed and Westside Fish and Chips was born. The decision was made to make the variety store smaller and start the restaurant with 12 seats, which was eventually turned into 48 seats with a fully licensed patio. In 1992 the restaurant out grew the variety store and 128 Main Street was purchased and the store moved over to it’s present location. There have been many additions and changes over the years with my Dad (Chris) and Grandpa working late into the night behind the scenes. My Dad and Grandpa love this place, but nobody loves it more than my Mom, Grandma and Aunt Sharon who have given everything to make Westside the success that it is today. Of course, they will not take all the credit, as their dedicated employees, some near exceeding my 25 years, play a huge role in making Westside what it is today. 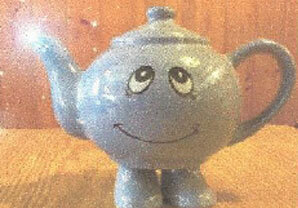 It was so long ago that the date eludes me but it had to be around 1990 that the whole teapot collection started. It really, truly started as a joke, a joke gone wild!